Since 1992 CentreBet have grown to be one of Australia's leading online bookmaker, offering up to 9,000 sports and horse racing markets every week. Their apps and mobile site work on virtually every type of phone and tablet. iOS and Android apps available. Fully functional mobile site for other devices. 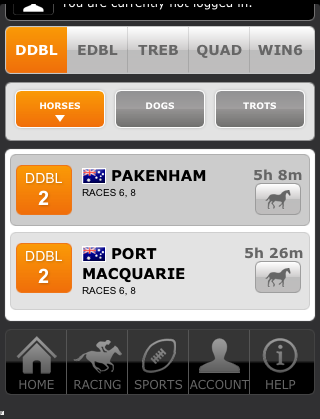 Wide range of Australian and worldwide racing - horses, dogs and trots. Get a $200 bonus racing bet when you register for a new account. 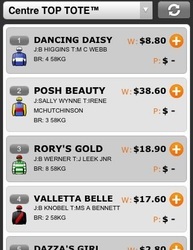 Interim dividends are now shown in the racing results section. 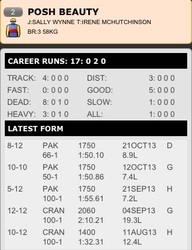 Full form section. Bet types: Top Tote, Best Fluc, Fixed Place, Quinella, Exacta, Trifecta, First Four. 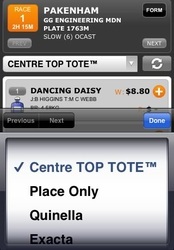 Centrebet are one of the biggest and oldest bookmakers in Australia. The company has been in operation since 1992 and over the years have gone through many changes, mainly for the positive. Like many bookmakers, the company has changed hands quite a few times with their latest and arguably highest profile owner now being that of William Hill after a fee was settled in March 2013. Whilst at the time of writing this review the company hasn’t changed all that much since the takeover, it’s highly likely that in the years to come Centrebet will be making more positive strides in the Australian and worldwide markets. One of the biggest advancements the company has gone through is a move into the world of online betting and now mobile betting. In previous years there is little hiding in the criticism it received for its bookmaker in terms of both layout and design, but their latest release has been one that seems to suit much more favourably for the majority of punters. The inclusion of mobile betting has been a massive success for the company and the release of their betting app in 2012 is something that we will be looking a lot closer at throughout this review. 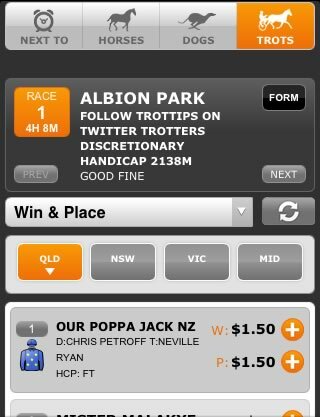 The purpose of this review will also be dedicated towards how their horse racing section functions on the app. The sport has been a predominant figure for Centrebet from the day it formed, so we are heading into this with high hopes to what should be a pretty comprehensive section. First up we must mention the aesthetics of the app, only because it looks so damn good! It’s quite a minimalist look but the black background and white text make it look slick and modern. There are few images on page which massively reduces load times – thumbs up – and it’s very easy to navigate with a series of quick links available at the bottom of the app. 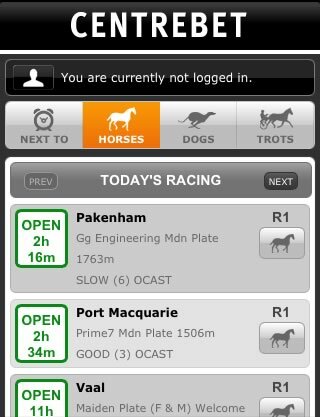 A great start to life on the Centrebet app it has to be said. 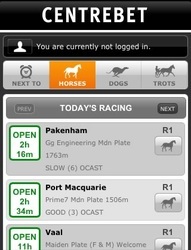 The home page allows you to get an idea straight away of how prominent horse racing is for the company. 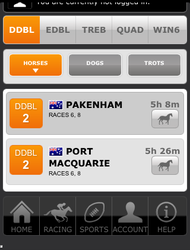 There are not only options to click the sport from the home menu, but also a quick link button at the bottom of the screen. 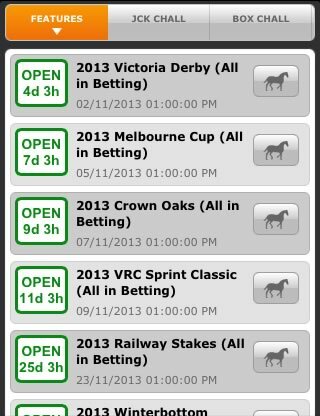 In fact there are no fewer than four options to go to some form of horse racing betting markets. What is interesting on the homepage is that there is a lack of any markets that are live or upcoming. Often apps have something along the lines of ‘next 6 races’ straight from the homepage but Centrebet have seen fit to exclude this feature from there’s. In all honesty it probably won’t make that much difference, but it is a feature that we think allows punters to simply dive straight in and also become aware of which sports/ markets are currently running. The horse racing section actually includes dog racing and harness racing in the initial line up of ‘next to jump’ markets. This is basically a list of the meetings, name of race, distance, time and a countdown as to how long it is until that race starts – this countdown is refreshed automatically, unlike some apps we have tested. The horses section at the top of this page allows you to see a more detailed look at the meetings that are taking place. What’s good about this section is that it also includes results of races run that day. Unfortunately it doesn’t seem as though you can sort races by meeting and also it doesn’t always indicate where in these races are taking place as they do international racing as well. The next section we want to talk about is arguably the most important; the race card. 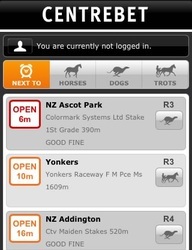 The race card should be the hub of the action, where everything that REALLY matters in the app happens. Centrebet have a well laid out card with information on the horses, stall numbers, race distance, length of race, ground and then odds for both the win and place. A good addition is a little drop down menu at the top of the card that allows you to flick between different betting markets that might include Quinella, Exacta, Trifecta and First Four. These are betting types that are much more popular in Australia than other countries in say Europe for example, but are generally just forms of markets that most bettors will have some knowledge of. We want to finish by taking you back to the homepage where there are two options called Racing Features and Racing Multiples. The multiples page allows you to dive straight into a card where you can pick a number of horses from a variety of races to form a multiples selection. 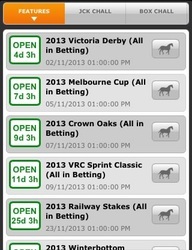 These can range from doubles, trebles, quadruples and there winning 6 selections. 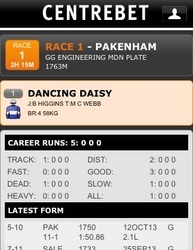 Obviously the more horses you add to your slip the higher the pay-out. We like this feature because it’s one of very few have seen like it and it’s something just makes so much sense. 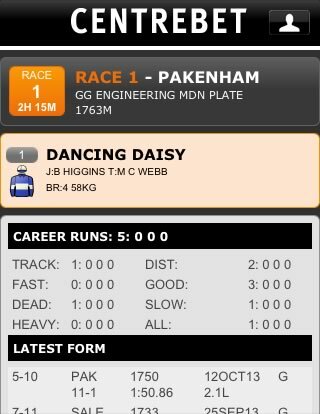 These betting types are obviously going to be popular for all punters, never mind horse racing punters and a quick way to select horses makes perfect sense to us. The next section is the Racing Features section and this allows you to view some of the higher profile race cards well in advance – most horse racing fans may be familiar with the terms ante post and even futures markets with this being very similar. It differs slightly in that it does include some specialist markets such as top trainer or jockey throughout the calendar year. 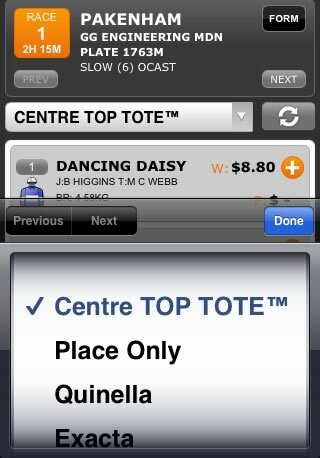 When you create a new account with CentreBet you can take advantage of a free bet bonus of up to $200. CentreBet offer weekly money back specials as well as a $50 free bet when you refer a new player. 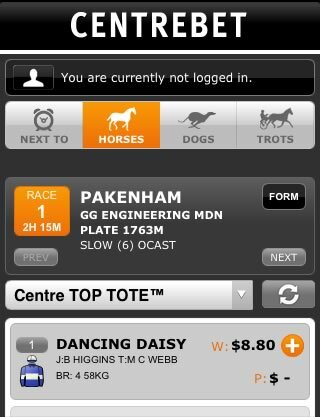 If your horse is first past the post but gets beaten in a Stewards' enquiry, CentreBet will stay payout. 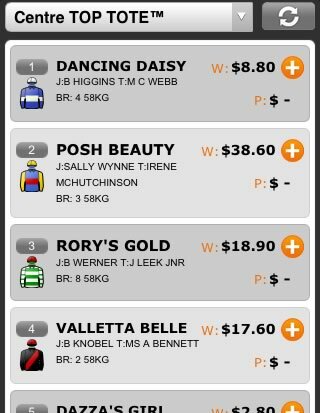 Before reviewing the horse racing section for the Centrebet app we were very excited and intrigued as to how far the company – if at all – had come under the just few months it had been taken over from William Hill. In all honesty, not much has changed, yet, but then again this already high quality product needs little to be tweaked with. The aesthetics on the app are one of the standout features in our opinion. We have used and reviewed countless betting apps now to know what works and what doesn’t, and this is definitely something that works. 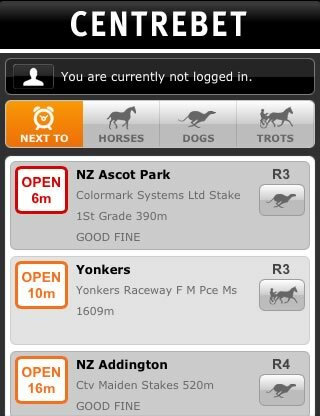 The graphics are simple and low key, but these simply add to the ease of use you now get with the app. The only downsides potentially come with the lack of any substantial information when it comes to the horses or allowing punters to see extensive information regarding the horse. It’s not going to be a place where you can form your picks from, but it will provide an app that we would recommend to all of our readers.